It’s chest day: which exercises are you planning to knock out? Wait, wait, let us guess. Bench press? 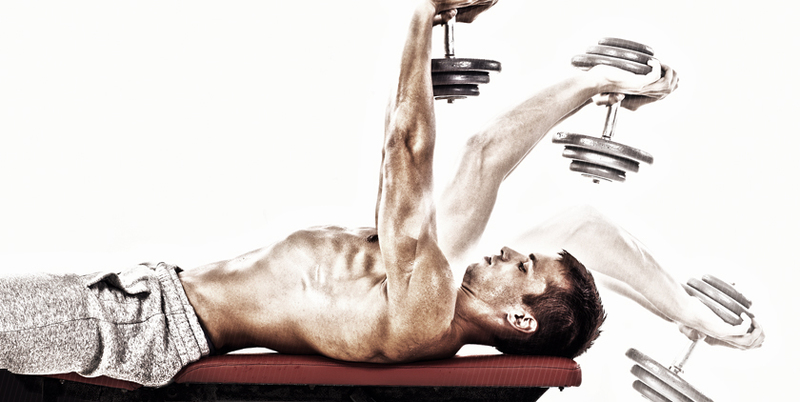 The bench press is the go-to exercise for anyone trying to build up strength in their chest. However, strength isn’t always about pushing a lot of weight. It requires smart training and trying exercises others might not. The dumbbell pullover is one of those exercises. In order to really force your pecs to grow, you need to stretch the chest, and this exercise helps elongate the muscle. A longer muscle is a stronger and safer muscle. Plus, performed at the end of your workout, dumbbell pullovers maximize your pump by forcing blood into the pecs. Place a light dumbbell standing on end on a flat bench. Lie perpendicular on the bench, with only your shoulders on the surface. Keep your knees bent, feet firmly on the floor and make sure your hips are below your shoulders and the bench. Your head will be off the bench on the other side. Grab the dumbbell with both hands and hold it straight over your chest with a bend in your arms. Both palms should be pressed against the underside of the dumbbell. This is the starting position. While keeping your arms in a bent position, slowly lower the dumbbell in an arch over your head. Stop when you feel a stretch in your chest. Exhale and raise the dumbbell back to the starting position through the same arch that you used to lower it. Stop once the dumbbell is straight over your chest. Incorporate 3 sets of 20 reps at the end of your chest workout. Once you feel the stretch the dumbbell pullover provides, it might just become one of your chest day staples. All readers are advised to consult their physician before beginning any exercise and nutrition program. BPI and the contributors do not accept any responsibility for injury sustained as a result of following the advice or suggestions contained within this content.